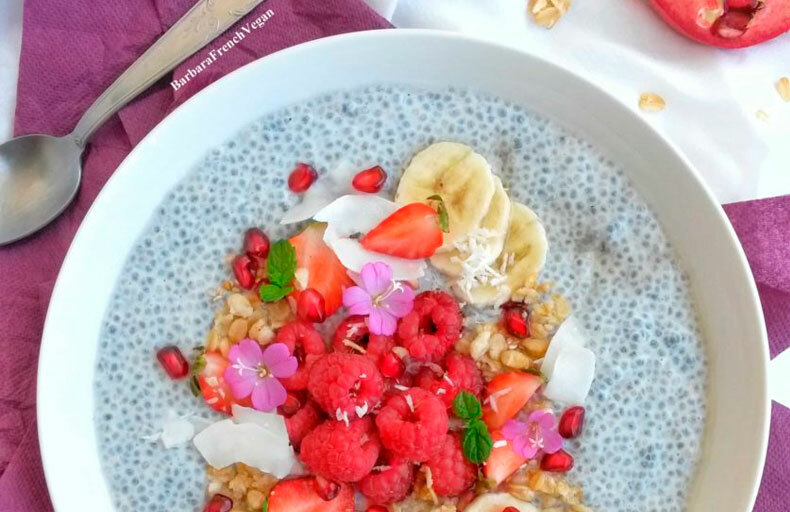 Chia seeds are a wonderful source of omega-3, proteins, fibres, calcium, etc. They are considered a superfood. It has many benefits such as helping digestion along, helping preventing from some cancers, cardiovascular diseases and type 2 diabetes. – Mix chia seeds and non-dairy milks. Let inflate during 10/15 minutes. – Add agave syrup and soya coco yogurt, remove. – Spread the preparation in a bowl or a plate. For her part, Barbara decided to use raspberries, bananas, granola, pomegranate and coco shavings. You can also add compote, red berry coulis, chocolate… Whatever you want! Thanks again to Barbara! Join her on her blog and instagram!